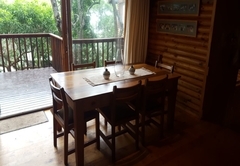 Die Boomhuis is a property providing self catering in Keurboomstrand for up to 7 guests visiting the Garden Route region. 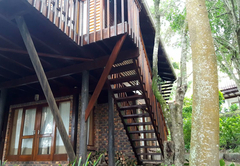 Die Boomhuis ('The Treehouse') is a beautiful wooden log home built in the typical Keurboomstrand style. 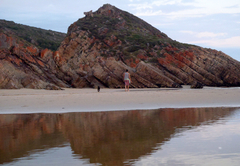 It is nestled among indigenous Milkwood trees in which loeries are often spotted. 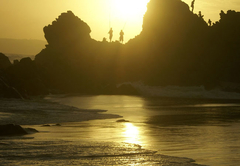 A number of pristine beaches are within walking distance, as is the popular Enrico's restaurant, the only business in the otherwise sleepy village. 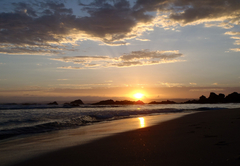 For groceries and other necessities, Plettenberg Bay is only 10 minutes away. 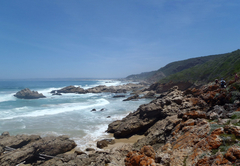 The well known golf courses of Plettenberg Bay and Knysna are also nearby. 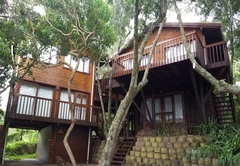 Die Boomhuis is hidden away under the sprawling branches of indigenous trees. 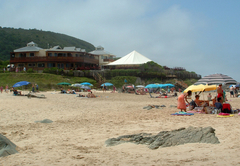 The property is situated only one street above the beach, at the foot of the steep hillside against which many of the houses in Keurboomstrand are built. 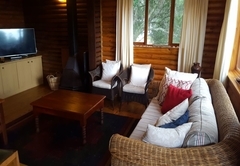 This beautiful wooden log home is reminiscent of a rustic cabin in the woods, yet offers all the modern amenities needed to ensure a comfortable stay. 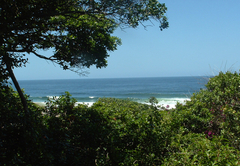 The main bedroom is on the upper level and offers a beautiful view of the surrounding trees and the ocean. 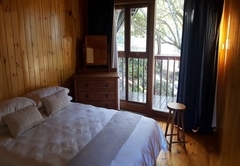 The room is furnished with a double bed and one single bed. 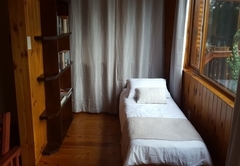 The latter is ideal for young children who need to sleep close to their parents. 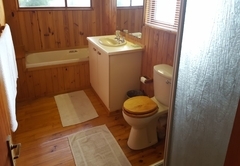 Adjacent to the main bedroom is a bathroom with a toilet, bath and shower. 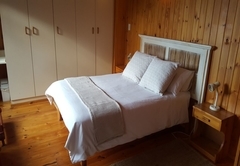 The lower level has two bedrooms, one furnished with a double bed and the other with two single beds. The adjacent bathroom has a toilet and shower. 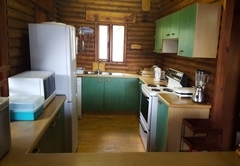 The upper level has a third bathroom next to the kitchen, offering a bath and toilet. 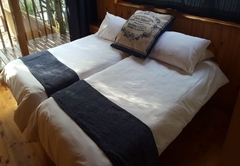 Quality bedding and bath towels are provided. 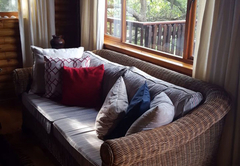 The living room is equipped with a fireplace for the cold winter months, whilst the large stoep is perfect for a summer braai followed by dinner under the stars. 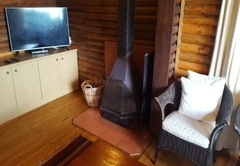 A flat screen TV is available, but please bring your own DStv Smartcard. 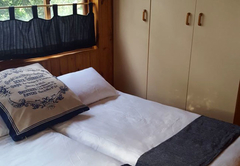 The kitchen is well equipped for self catering and includes a fridge, freezer, electric oven and stove, dishwasher, microwave, kettle, toaster, toasted sandwich machine, smoothie machine, crockery and cutlery. 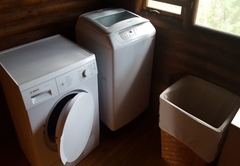 The laundry is fitted with a washing machine and tumble dryer. 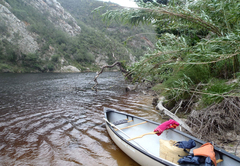 Please note that Keurboomstrand can become very cold in winter, so pack warm clothes. It is also renowned for hosting four seasons in one day, so it's always a good idea to pack clothes for any event.